During the podcast we get into some detail about a few of the players, including Jim Konstanty of The Whiz Kid Philadelphia Phillies of 1950. In order to get the complete history of Konstanty’s year, Rich sent the manuscripts off to Jim’s wife Mary and she contributed greatly to getting the documentation correct. We talk about one of the all-time tough luck players in Harvey Haddix. 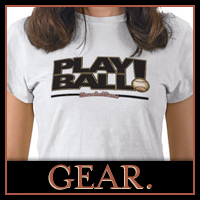 A number of players during this era had to deal with obligations for service of World War II. At first Haddix was requested to stay at home and work the farm, but later was drafted into the military. It wasn’t until after his service that he entered professional ball as an older 24 year old. During the 1952 season he had a cup of coffee and pitched in 7 games. After winning 20 games in 1953 it was determined he was ineligible to win the Rookie of the Year award because of his appearances the previous year. Bad luck would strike him again, literally, off the bat of Joe Adcock in 1954 with a shot to the leg that derailed a very successful season. 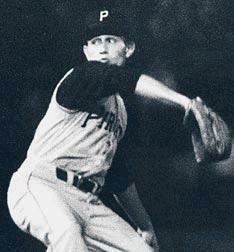 It was the 1959 season when Haddix pitched into the collective lore of baseball as a Pittsburgh Pirate, by taking a perfect game into the 12th inning only to lose it in the 13th, again off the bat of Joe Adcock. Major League Baseball rule changes have subsequently taken place, including removing the credit for a no-hitter because it now has to be achieved in a complete game. Of course we all know that Harvey Haddix achieved 12 innings of perfection! We don’t try to put Rich on the spot, but we know that there are many other players in decades past not chronicled in his book. We decide to give a lineup of potential players worthy of recognition in a volume and put it to the listeners to take up the keyboard and craft a companion to That One Glorious Season. We express our sincere gratitude to Rich for sharing his stories with us and for taking the time to appear on the Cover the Bases podcast. 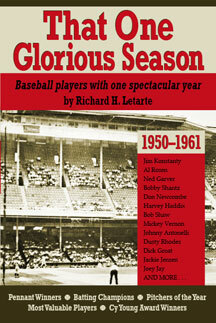 Follow this link to purchase a copy of That One Glorious Season: Baseball Players with One Spectactular Year, 1950-1961 or visit Rich’s web site at GloriousSeason.com. 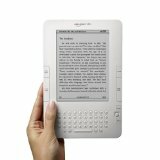 If you like hearing about the baseball books we profile on Cover the Bases, it might be time for you to pick up a Kindle from Amazon, so that you can take all the best Baseball Books with you, no matter which stadiums you visit. Always an interesting topic. I have actually been working on a blog post about One Season Wonders from the past fifteen years. There are many. Bill .. Brady Anderson has become the go to name when looking at aberrational years! Hamilton's 2008 season may also be one of those one-year wonders. Great interview – Author's enthusiasm comes shining through, and has made me want to read the book, and listen to more of your podcasts. This is a reminder that on December 18, Bill Miller sent you an invitation to become part of their professional network at LinkedIn.